Classic Lasagne al forno with Bolognese. 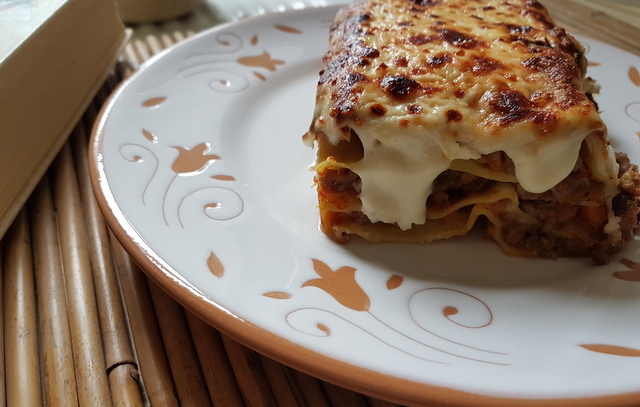 Lasagne al forno with bolognese sauce is probably one of the best known and most popular Italian pasta dishes, alongside its cousin tagliatelle bolognese. 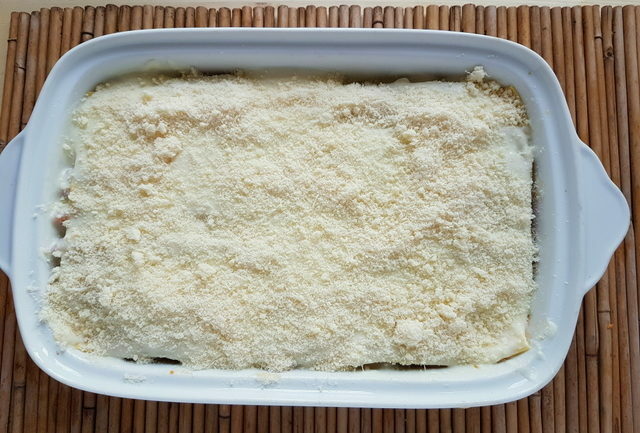 Nowadays, there are many different kinds of baked lasagne recipes including with seafood, vegetarian versions and what Italians call ‘bianco’, without tomatoes. In fact, the original lasagne al forno was made without tomatoes because tomatoes didn’t exist in Italy until 18th century. The origins of baked lasagna actually date back to the times of Ancient Rome and Greece. The Greek word ‘laganon’ and the Latin word ‘laganum’ were used to describe square or rectangular sheets of ‘pasta’ made from wheat flour and baked in the oven or on the fire and stuffed with meat. The Roman ‘cookbook’ Apicius (a collection of Roman recipes compiled in 1st century AD) includes a ‘lagana’ formed by thin sheets of dough stuffed with meat and cooked in the oven. But, of course this only vaguely resembled the lasagne al forno we know today. Although lasagne pasta was popular in the Middle Ages, it wasn’t made with eggs until the invention of egg pasta in Northern Italy, in the Renaissance period. Béchamel sauce was also not invented until the Renaissance and tomato sauce didn’t enter the equation until the 18th century. So, it was only then that lasagne al forno started to look like the much-loved dish of today. Here in Italy, two regions claim the invention of baked lasagna, Emilia-Romagna and Campania (Naples). 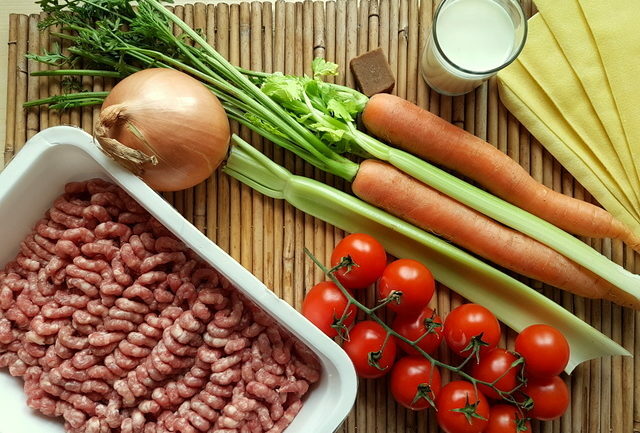 However the Neapolitan version includes ingredients such as meatballs, sausage, hard boiled eggs and ricotta cheese rather than béchamel, as well as other cheeses like provola and pecorino. The lasagne pasta also usually has ruffled or wavy edges (lasagne ricce). Because it’s such a rich dish, Neapolitan lasagna is mostly made on special occasions, especially at Carnival time. This dish was traditionally served on Mardi Gras as a kind of last blow out before Lent, as it was filled with many ingredients that were banned during Lent. Green lasagne al forno in Emilia. 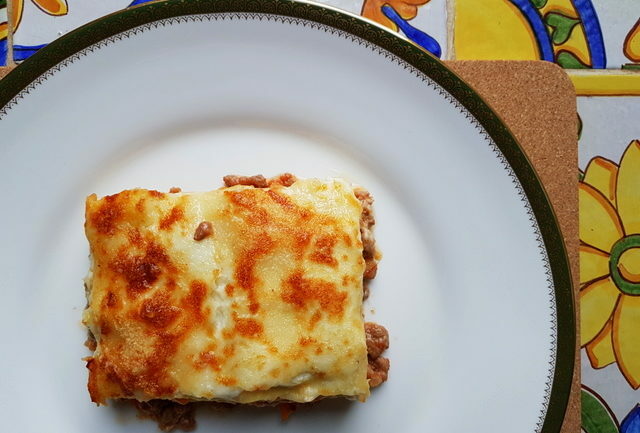 Neapolitan lasagne al forno is magnificient, but the dish most non-Italians call baked lasagna or just lasagna is the one from Emilia-Romagna. 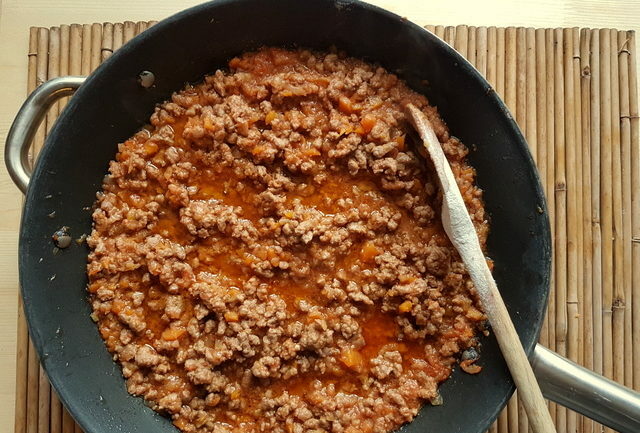 This recipes is made with Bolognese ragu, béchamel sauce and normal lasagne sheets which are often homemade, but can also be bought fresh or dried. For this recipe I used fresh pasta sheets and didn’t precook them. 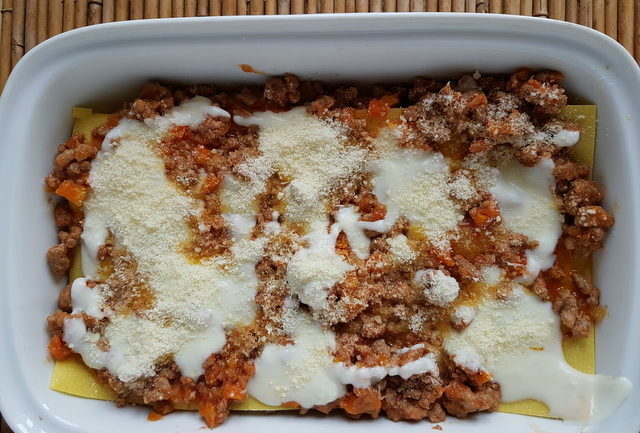 Dried lasagne sheets need to be half-cooked before assembling the final dish. Lasagne al forno is made in other Italian regions too and they each add a local touch to the dish. In some mountain areas, for example, the meat sauce is often replaced by mushrooms. In Liguria, it’s made with pesto and here in Veneto with red radicchio from Treviso. 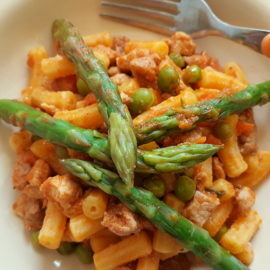 Whilst in Umbria and Marche there is a particular version called vincisgrassi, in which the meat sauce is enriched with chicken or pork giblets.The meat sauce is replaced by porcini mushrooms, truffles and pecorino cheese in the Apennine mountains. In Sicily, there is also an ‘alla Norma’ version, with eggplant. And last but not least, there’s the excellent Sardinian lasagna made with carasau bread. 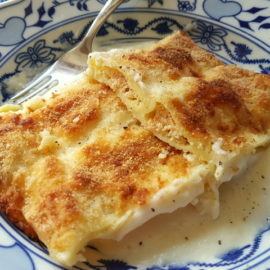 You too can make your own version of lasagne al forno. 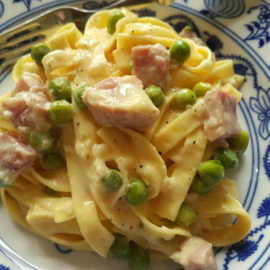 However, this classic recipe is divine and well-worth following. For best results I’d recommend making your own lasagne pasta sheets, béchamel sauce and Bolognese ragu. 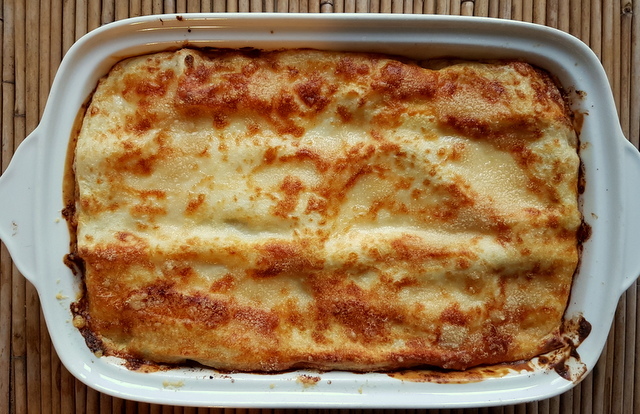 But not everyone has time for that, so cutting corners with store bought pasta and ready-made béchamel will still ensure your lasagne al forno is delicious. However, I’d definitely recommend making homemade Bolognese! Ideally, how many layers would you have? Hi Iain. I usually end up with about 4 layers of pasta. However, some Italians make up to 8. It depends on how deep your dish is and how much sauce etc your put between the pasta layers and how thick the pasta sheets are. Thanks for the history lesson Jacqui, never knew tomatoes weren’t grown in Italy until the 18th century. My wife is a big fan of lasagna and I’m she’ll love it, maybe I can surprise her with this recipe one day. Thanks for sharing! I make lasagna every single year for Christmas and during the year, I try out as many new recipes as I can to be able to surprise my family with a new twist each time. I will bookmark your recipe and try it next weekend! It looks SO good! Looks yummy!! Love ask the information as well!! Thanks so much MakingHerstory! I’m happy you like the dish and the info! All the best from Verona! Jacqui. I had no idea there was such a history behind lasagna! I like mine without meat and a lot of cheese. I’ve never heard of hard-boiled eggs in it, that would definitely be different! I love a lasagne and I love this version with the proper ragu. So rich and comforting! I love all the different variations and customization ideas you give! Great recipe!! A good lasagne is a thing of great beauty and it is such a forgiving dish too with loads of room for reheating and scaling. Yours looks delicious!